Great color scheme for a GTO! Those of us of a certain age used to worship (or close to it) muscle cars in the 1960s, and many credit Pontiac with launching the idea of a muscular mid-size car that the masses could afford. 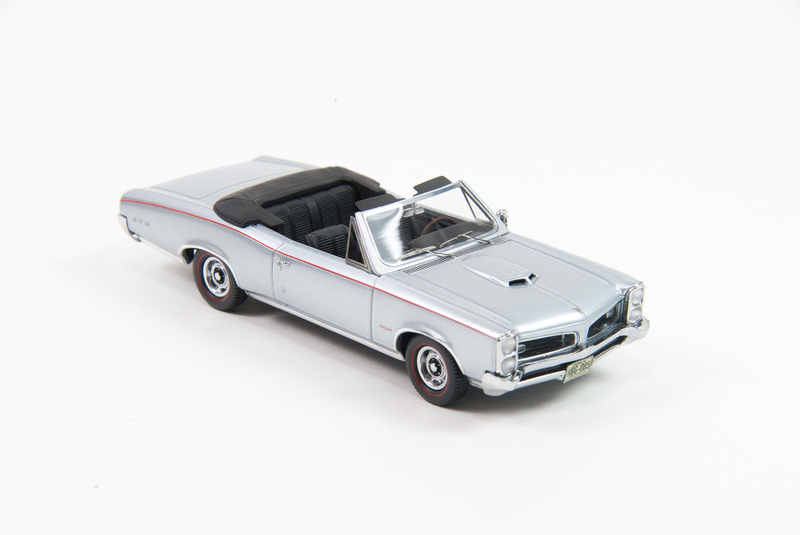 Pontiac’s first was the 1964 Tempest with the GTO package ($295) that added a 389 cu.in. V8 that delivered 325 horsepower with a 4-barrel carb. 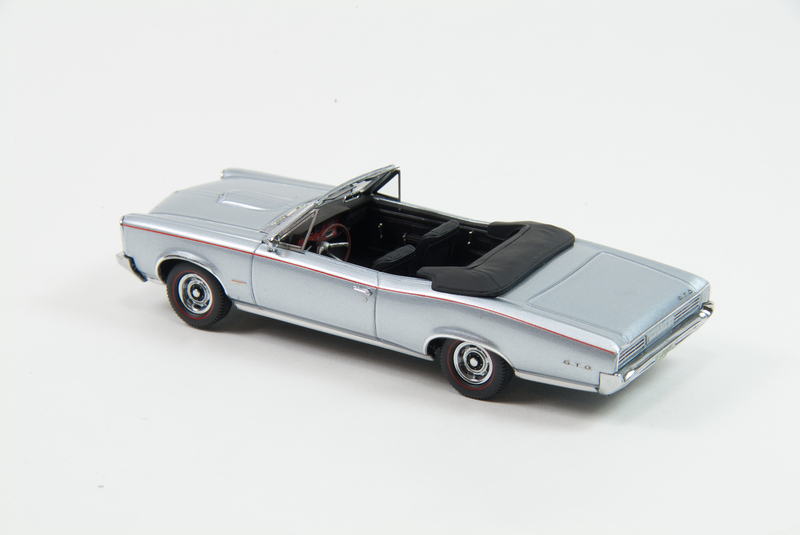 Otherwise the hardtop and convertible Tempests were typical family cars. 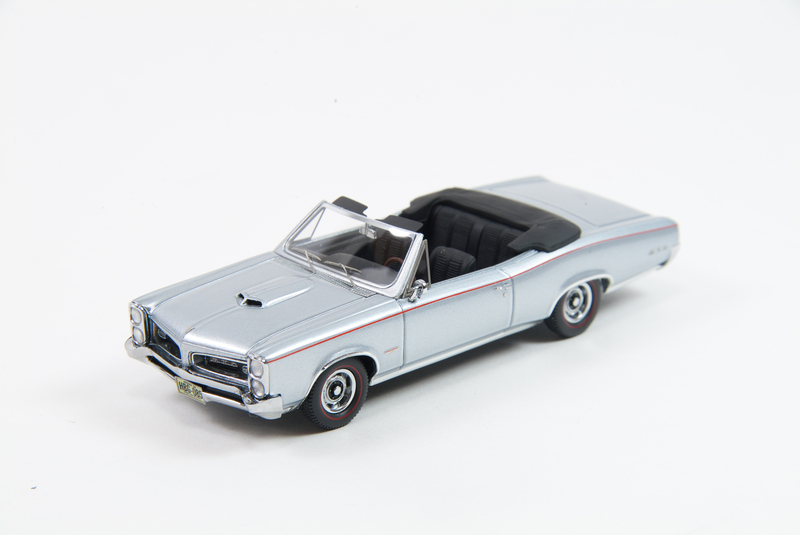 Certainly there are a fair number of die-cast models of GTOs these days, but NEO has added the 1966 Convertible version to its growing America car collection in 1/43 scale. Our review model came from the good folks at American-Excellence. As with other NEO models in this scale, this one is expertly executed. 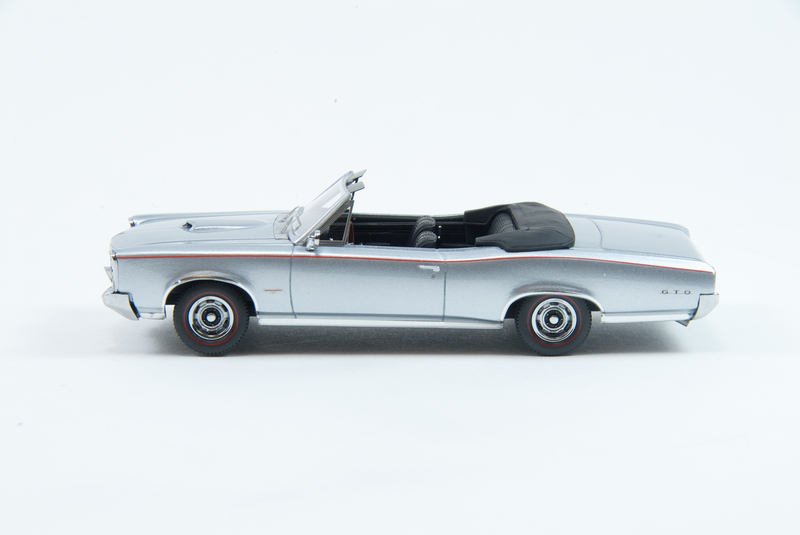 In the mid-1960s there were a lot of hardtops and convertibles, not so much these days. 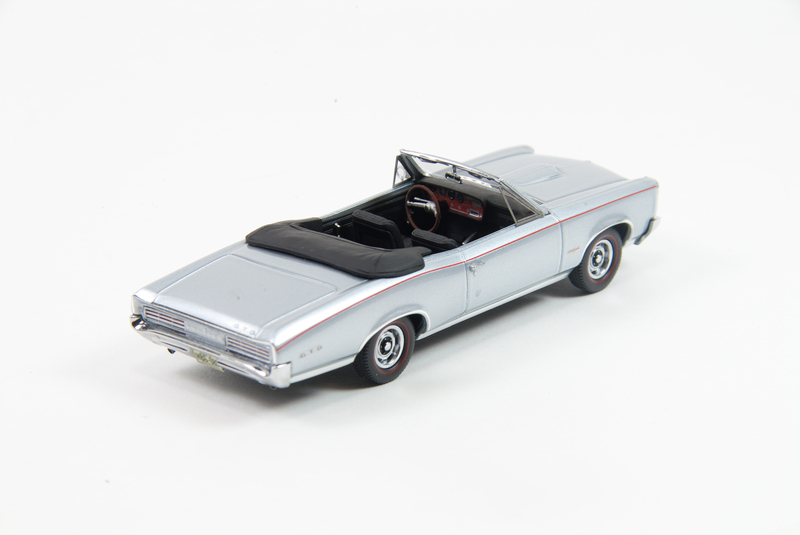 But in 1966 Pontiac wisely made the GTO a separate model from the Tempest and was restyled to include a kicked-up rear fender line. The car rode on a 115-inch wheelbase and was just over 206 inches long. Its lines accentuated its length to give it a lean yet muscular look that matched its performance persona. It still packed the powerful V8 engine and a Ram Air package was available too. The hood scoop helped emphasize the car’s power. Pontiac also added walnut veneer to the dash and new Strato bucket seats and for the taillights it went with a louvered look that was unique to the GTO so it was easily identified from the rear. The changes worked, the GTO selling nearly 97,000 units, the most ever for the model. NEO’s model is what it calls metallic gray, but what most of us would consider silver with a matte black interior and tonneau cover that looks plenty sporty. The Pontiac’s handsome lines are crisply executed and feature photo-etched lower body trim that goes over the wheel wells. There are chrome mirror and door handles too, plus vent window trim and delicate chrome wipers. I like the sharp red pinstripe that runs the length of the car and is accented by the red-line treaded tires. In front the stacked quad headlights look realistic and there are small oval running lights on the split kidney-shaped Pontiac grille. There’s also a dark GTO logo on the driver’s side grille face and PE GTO markings on the trunk along with Pontiac spelled out between the 9-louvered taillight fixtures in back. Further, there are GTO labels in PE on the rear quarter panels. NEO does a nice job with the good-looking split twin air scoop on the hood and sharp matte black interior. Convertibles are great because you get a much better view of interior detail. These black ribbed Strato bucket seats and rear bench look great and the door trim matches, plus you can easily see the chrome-look window cranks. The dash clearly shows that fake walnut trim along with the GTO’s unique quad gauges. There’s also a big chrome park brake lever on the console hump and a wood-look 2-spoke steering wheel. Overhead are black sun visors and a chrome rearview mirror hanging from the windshield’s frame. Underneath are dual chrome exhaust pipes and there’s an Arizona license plate front and rear. 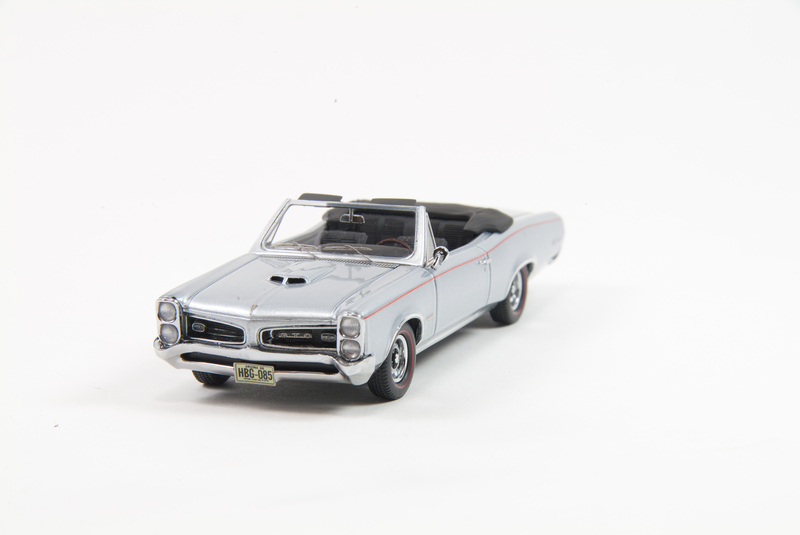 NEO’s GTO is a pretty car and looks sharp in this scale and paint scheme.